Browning was a Victorian playwright and poet, born into wealth. His abolitionist father and devoutly nonconformist mother had amassed a collection of 6,000 books in their home library, and, from a young age, Browning was fluent in French, Greek, Italian and Latin. He had only brief flirtations with atheism and vegetarianism, but his dedication to writing was so indefatigable that he lived at home without a career, supported by his parents, until his marriage to Elizabeth Barret in 1846 (he was 34). 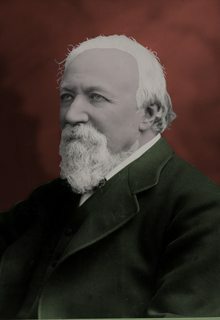 His notable works include The Ring and the Book, Porphyria’s Lover, and Men and Women, a collection of his poetry which includes the long-form poem Childe Rowland to the Dark Tower Came. Browning’s Childe Rowland depicts a journey of madness; the quest of an apparent young paladin approaching some unknown nightmare climax as he arrives, at the end, at the mysterious titular Dark Tower (‘Childe,’ herein, refers specifically to an untested knight). The first line alludes to a popular fairy tale, originally an 11th century Scottish ballad, “Child Rowland.” That story tells of a prince, Roland, who goes looking for his sister, Burd Ellen, who has accidently circled a church widdershins (opposite of the sun, or, anti-clockwise) and disappeared into the trans-dimensional Elfland. Roland’s older brothers both fail in their efforts to rescue Bird. On Merlin’s advice, Roland enters Elfland but does not eat or drink therein, and beheads all who speak to him (even those who help him on his quest) until he finds his sister in her prison chamber. Forgetting the words which would thusly return them home, Roland is forced instead to best the King of Elfland in combat with father’s sword. The King is shown mercy, however, and so he agrees to send Roland, Burd Ellen and their brothers back home to their castle at last. Although Browning’s poem does not appear to relate to these characters (or their story) whatsoever, it should be noted that the current most popular version of the fairy tale, written by Joseph Jacobs in 1892, refers to the King of Elfland’s palace as the ‘Dark Tower,’ presumably in homage to Shakespeare, or Browning, or both.